Cooking can be a hobby, a dreaded necessity or just a part of your routine, but no matter what your relationship with the kitchen is like, cooking takes time and effort. That’s where apps for iOS and Android step in, offering step-by-step instructions to help you prepare a hearty home-made meal or curate a weekly meal plan that goes with your diet. Cooking applications vary in their sophistication - some cater more to the needs of chefs, while others are invaluable for somebody who’s struggling with basic recipes. There are all-in-one apps and apps that focus on one function: listing ingredients for recipes, creating meal plans, providing suggestions for cooking. But most successful cooking applications, regardless of what they focus on precisely, share similar qualities: a simple design that combines mouth-watering pictures of food with a social component and an easy-to-navigate recipe manager. At Yalantis, we’ve previously written about what it takes to develop a great grocery shopping list app. Now we wanted to look into successful cooking apps and see what makes them popular. We’ve identified five different types of cooking apps: built-in recipe collection apps, customizable do-it-yourself recipe collection apps, social cooking apps, reference book cooking apps, and kitchen tool apps. Each type has its own unique development challenges and appeals to a slightly different audience. BigOven is one of most popular tools for recipe management and meal planning. It combines a built-in library of recipes, sorted by category, with meal planning functionality. In practical terms, this means you can create a shopping list based on the recipe you choose. Recipe apps can be overwhelming if thee are too many details, but BigOven knows how to provide all necessary instructions in a smart and concise way. Food Network also offers an app with their own recipe collection. Their main selling point is that their recipes come from well-known chefs that you can see on popular TV cooking shows. The Food Network app has a convenient navigation system and a collection of helpful how-to videos for more complex recipes. Food Network’s app is praised for its search functionality, which lets you find recipes containing a particular ingredient or by a particular chef, and also for its wide selection of categories that makes finding exactly the recipe you want quick and easy. The app lets users set up multiple timers so that they can prepare several ingredients simultaneously. 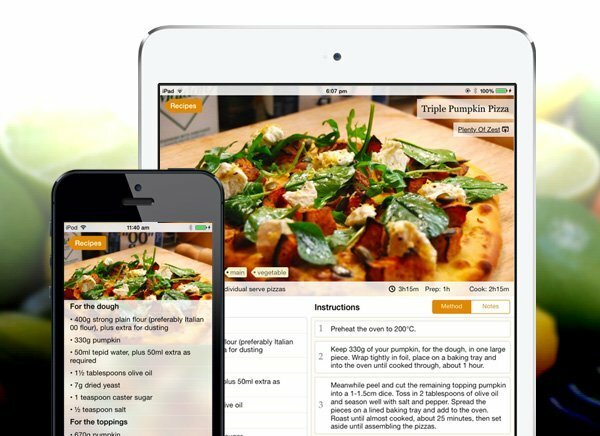 Zest operates in a slightly different manner than BigOven or the Food Network app, providing only a handful of recipes and leaving it mostly up to their users to add their own customized recipes to their collection. Since Zest is built around the idea of curating your own recipe collection, it has features that allow users to scrape web pages using a built-in browser and automatically divides recipes in three sections: summary, list of ingredients, and step-by-step cooking guide. Zest also lets users share recipes through email and share links to their favorite recipes on Facebook and Twitter. 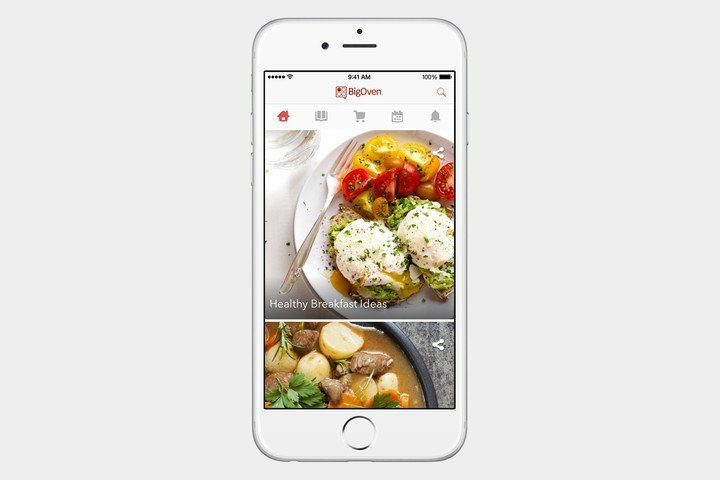 Paprika is another successful recipe management app that allows users to capture online recipes and sync them automatically between devices. Most recipes found on food websites can simply be saved with the click of a button, but even entering recipes from non-compatible web-pages is quicke. Just like BigOven, Paprika makes it easy to generate meal plans based on your saved recipes. Meal-planning calendar that lets users create menus for a week or a month. 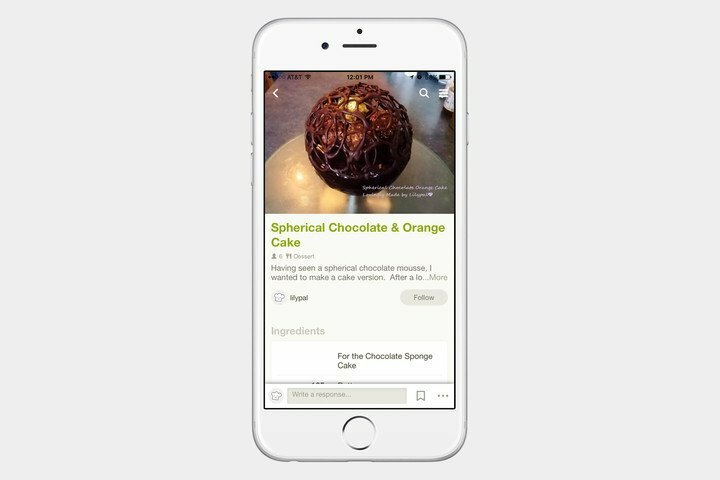 Cookpad is a cooking app for social media fans, offering a space where users can exchange their favorite recipes. Cookpad lets users upload a picture of the finished dish and make comments – they might note what can be used a substitute for rare ingredients in the recipe, offer a warning about potential food allergies, or include a suggestion for a side dish that goes well with the meal. Speciality Produce represents a different type of mobile app that is equally loved by experienced cooks and the general public. With a dictionary of ingredients – from most basic vegetables to exotic fruits and rare spices – each entry has information about the history of the ingredient, its taste, preparation techniques, and links to recipes that require the ingredient. Users can search within the app either by ingredient or by PLU codes, making the app useful in many markets around the globe. Speciality Produce features more than 3000 ingredients, including rarities that even an experienced cook might not be familiar with. The last – simplest – group of cooking and food-related apps are apps that replace standard kitchen tools, helping users convert units of volume, weight, or temperature, or set a timer for what’s in the oven. This type of a kitchen app is pretty simple to build, and cheap as well. But the problem is there are tons of competing apps like these on the market. Some cooking apps might be better suited for professional cooks, whereas others are good for anyone who’s just learning basic skills, but undoubtedly there are certain must-have features that help great cooking apps stand out and gain a following. What does an ideal cooking app look like? An ideal cooking app makes it easy to access information and use the app while cooking. Certain formats such as short video guides and gifs are more kitchen-friendly that lengthy text descriptions. An ideal cooking app has a UI that can be adjusted to work across multiple devices and screens. An ideal cooking app lets you collect and customize recipes from other sources, as well as exchange recipes with others through social networks. An ideal cooking app has an essential built-in tool kit that helps with unit conversion or calorie intake calculation, or acts as a kitchen timer. The app market is already loaded with cooking apps for iOS and Android, so it takes attention to details and a well-thought-out design to develop a cooking app that has a chance of winning over the tech-savvy cook.